The need for timely, accurate, and complete streamflow data is critical during floods and heavy rains because these data are relied on by local, State, and Federal emergency management personnel for flood response purposes. 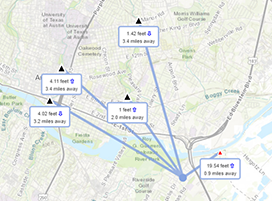 The USGS Texas Water Science Center is developing flood early warning systems with elevated streamgages, redundant monitoring and reporting equipment, and multiple communication systems. These systems will give first responders and citizens reliable and timely data during rapidly changing flood events. For more information about our flood expertise, visit our Flood Early Warning Science in Texas web page. U.S. Geological Survey field crews are measuring flooding throughout Texas as rainfall moves across the state. 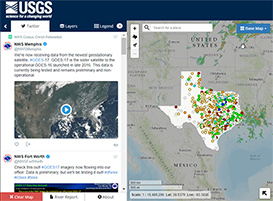 As of this morning, 38 USGS streamgages are over National Weather Service flood levels, and water continues to rise at 172 gauges throughout Texas. The National Weather Service has issued a flash flood watch for parts of central Texas through this evening. 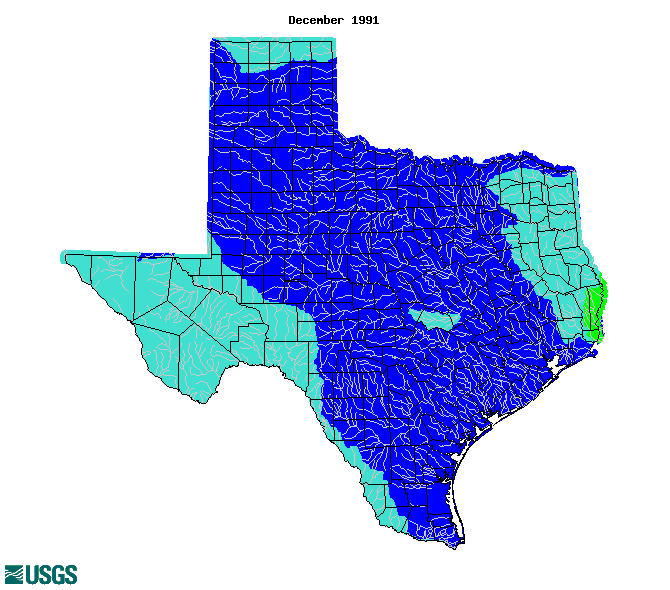 USGS real-time maps of flood and high flow conditions may be accessed using the USGS Texas Water Dashboard. Twenty USGS field crews are measuring floodwaters and verifying streamgage operations on the Rio Grande, Red, San Antonio, Guadalupe, Colorado, Brazos and Trinity River Basins. Today, crews will be flagging high-water marks on the Llano River, west of Austin, as it nears record flooding. 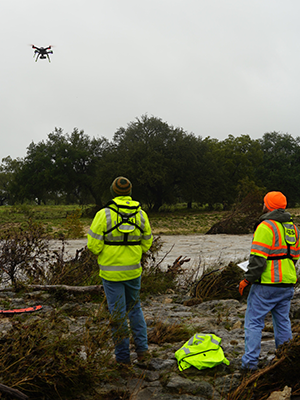 USGS scientists use a drone to capture flood imagery. This imagery is being tested as a new way to estimate streamflow. 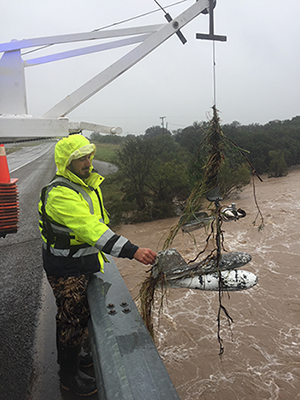 USGS scientist using a truck-mounted crane to take a streamflow measurement from a bridge over the Llano River. Two fully-autonomous Twitter feeds distribute water level and precipitation data during flooding or severe rainfall. Streamflows that are much above normal are shown in blue and black on the map.